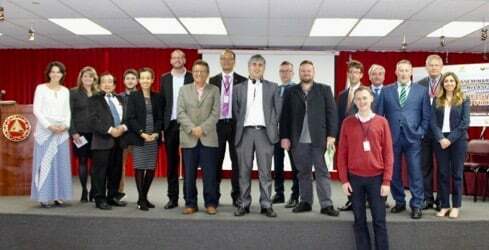 COLUMBIA Technologies, LLC, a veteran-owned small business provider of high-resolution site characterization services, and our Brazilan subsidiary, COLUMBIA Technologies do Brasil, Ltda. are pleased to support the International Seminar Relasc-Nicole Management of Sites Contaminated by Hydrocarbons. COLUMBIA's co-founder, Mr. John Sohl, will provide recent lessons learned in LNAPL Mobility, Recoverability, and How to Use High-Resolution. In addition, John will support a Workshop on Conceptual Site Model Development on Friday, 02 June. The seminar and workshop will take place in Lima, Peru 31 May through 02 June. 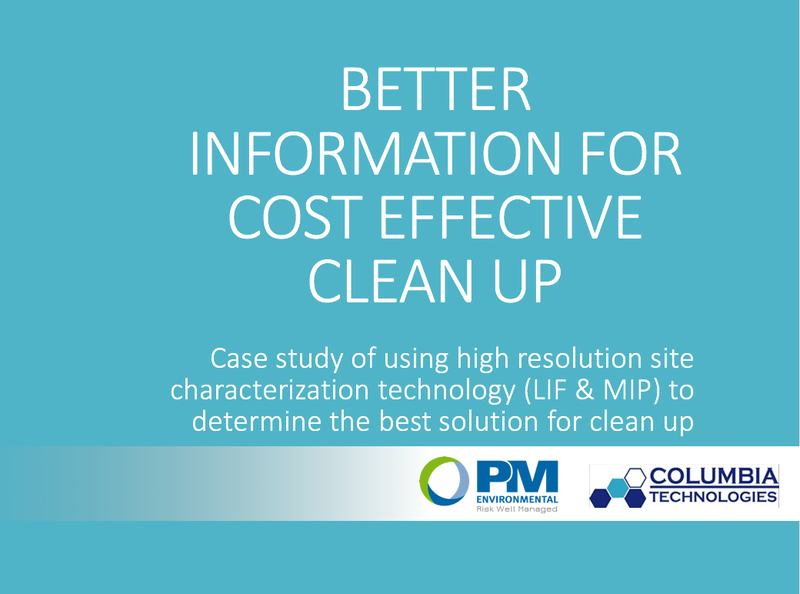 COLUMBIA Technologies was selected by PM Environmental to support a high-resolution assessment of a former retail gas station with persistent LNAPL contamination. The goal of the assessment was to evaluate for the Tennessee Department of Environment & Conservation the impact of better information on monetizing the cost of long-term correctives action at these types of sites. The site is one of 246 remaining "difficult to resolve" sites in Tennessee and is typical of the many of over 16,000 remaining Leaking Underground Storage Tank sites in the U.S. The project involved a careful review of historical documents, cleanup activities, and extended field activities after hours and at night. Detailed information gained through this effort delineated an extensive amount of residual gasoline within difficult soil conditions highlighting the need for careful consideration of remedial alternatives. The team employed the guidelines of the ITRC Technical and Regulatory Guidance for Evaluating LNAPL Remedial Technologies for Achieving Project Goals. With 30-years of experience in strategic planning, technical management, and laboratory supervision with the U.S. Navy, Gayle Goff, joins the COLUMBIA Technologies team in the role of Quality Assurance Manager. As our Quality Assurance Manager, Gayle is responsible for conducting self-assessments, analyzing quality performance metrics, and the execution of improvements of quality programs. During her time overseeing Safety and Occupational Health programs for hospitals, clinics, research laboratories and educational facilities worldwide, Gayle led key initiatives to streamline self-assessments, set performance metrics, and improve quality of programs in a well-focused, consistent, systematic and quantifiable manner. Brian McCann joins the COLUMBIA Technologies team in the Federal Program Manager position. Brian brings two decades of technical, strategic planning, and business development experience. He has successfully directed multimillion dollars in sales of professional services, as well as communications and leadership development products for individual and organizational development. Before joining COLUMBIA Technologies, Brian served as the Regional Sales Consultant for Education and Government at CPP, Inc. where he directed the sale of the highly renowned Myers-Briggs Type Indicator® instrument to the Federal Government and other institutions throughout the US. Brian offers extensive knowledge of Federal Government procurement and government markets. John Sohl, COLUMBIA Technologies' CEO, attended the 8th Symposium on the Design and Construction of Hazardous Waste Sites hosted by the Philadelphia Post of the Society of Military Engineers (www.samephildelphiapost.org). The focus of the symposium was how to incorporate performance based contracting into the environmental restoration of complex sites covered by the nation's Superfund Program. The remaining Superfund sites are extremely complex. Successful restoration will be driven by detailed characterization built upon multiple lines of evidence and the best available science and technologies. Successful participants in future cleanups will be characterized by highly collaborative teams with aligned goals, risk, and reward. Information will drive clarity and successful communication with all stakeholders involved in the restoration efforts. Even after restoration efforts begin, there will be a continuing need for adaptive management using data-driven performance metrics. The PBC contracts will be procured across multiple EPA regions in three major groups: Design Environmental Services (DES), Remediation Environmental Services (RES), and Environmental Services and Operations (ESO). Procurements will be open to both large and small businesses. The new contracting acquisition framework is being handled through EPA's Office of Superfund Remediation Technology and Innovation (OSRTI) (http://www.epa.gov/superfund/partners/osrti/) and FedBizOpps (www.fbo.gov). On Wednesday, June 12, 2013, our CEO, John Sohl will present Leveraging Advanced High-Resolution Site Characterization Best Practices to Plan, Target, and Enhance Bioremediation Efforts during the Innovative and Developing Processes and Protocols platform session of the Methodologies for Planning and Evaluating Bioremediation track. This year, the Second International Symposium on Bioremediation and Sustainable Environmental Technologies will be conducted June 10-13, at the Hyatt Regency Jacksonville Riverfront Hotel in Jacksonville, FL. The Symposium is organized and presented by Battelle, and conference sponsors are other organizations active in site investigation and remediation. For the remediation-focused site investigation professional, we believe that hydraulic permeability is no longer an option, but a requirement. As this post will outline, hydraulic permeability is key to identifying contaminant transport zones at LNAPL and DNAPL sites for remediation-focused site investigations. 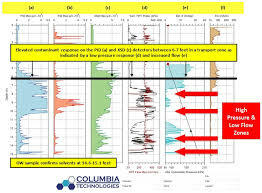 Hydraulic permeability data, which is collected with a Hydraulic Profiling Tool (HPT), enables decision makers to understand contaminant mobility and migration. Today, responsible parties and involved stakeholders are looking for more than just lab results from samples and screened well intervals, and are instead looking for data which enables them to minimize risk, reduce costs, and enhance remediation design efforts. Below is an example of an HPT log from a site with multiple contaminants at concentrations up to and including NAPL. The combined Membrane Interface Probe-Hydraulic Profiling Tool (MiHpt) was used to delineate the horizontal and vertical extent of contamination and collect hydraulic permeability data simultaneously. COLUMBIA Technologies is pleased to sponsor the upcoming Environmental Industry Summit XI in San Diego, CA. The Environmental Industry Summit is a national three-day learning event bringing together professionals from the environmental industry. The Environmental Industry Summit offers a unique opportunity to gain valuable perspective on today’s environmental industry providing ample networking opportunities, presentations, and panel discussions from the industry’s lead executives and analysts. Environmental Industry Summit XI is March 6-8, 2013 at the Hotel Del Coronado in San Diego, CA. The 2012 EBJ awards will be presented at a special ceremony at the Environmental Industry Summit XI. COLUMBIA Technologies CEO, John Sohl, will participate in the Executive Response Panel during the Environmental Industry Summit XI. During the Executive Response Panel, executives from 3-4 prominent firms will stress test the industry outlook and render opinions on how their companies will strategically and tactically address industry challenges. John will give perspective on how clean-up technologies are being used on different sites, and how they have evolved with the various challenges presented.